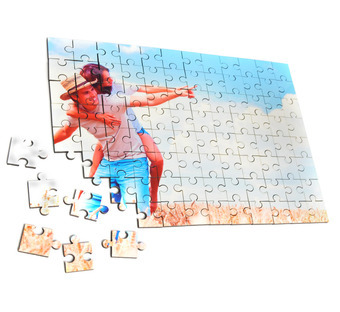 Create some unique fun with your own custom printed jigsaw puzzle. Printed high gloss on a wooden jigsaw puzzle. Comes disassembled- so no cheating for the builder. Very happy with the service. I can’t comment on the quality as the jigsaw has not been completed. Excellent quality and service. Really happy with the product! great quality,im very happy with it. Beautiful quality of print on jigsaw puzzle. Nice thick pieces. Packaging not very presentable as a gift. The jig saw was excellent. Very clear and nice thick pieces. The packaging could have been a little nicer then a little brown box. Great quality, I know it's been said before but a nice presentation box would make all the difference . A nice present to give a family. Beautiful product, top quality material used, delivered in 2 days, would pay extra for presentation box, as they come in standard brown box. Loved the jigsaw & the quality but if it was presented better in a box I would buy again. Bought it as a gift so had to find a box to present it in. Jigsaw itself is excellent quality. Not only is the printing fantastic but the wood quality, depth and feeling are great. Exceeded expectations. Great value for price. Ordered in Dublin on a Thursday night as a gift for a friend moving to Berlin Monday morning. Product arrived Monday so was delighted with quick delivery! I ordered this jigsaw as a birthday present for my girlfriend. I placed my order about three weeks in advance as I have had poor experiences with other printers for items of this nature in terms of the time frame for delivery and after sale service. I was pleasantly surprised when my product shipped out within 24-36 hours of my placing the order and I received email updates to keep me in the loop through every step. The packaging is a little simple in terms of a gift but this is a very small complaint to have. It was well packaged and it arrived quite safely as a result. The quality of the jigsaw is impeccable and it is far better than what I had expected. Absolutely great value for money and I will definitely return as a customer in the future. Bought 4 custom jigsaws. All top quality finish and produce. People on site were fantastic. I left it late to order and they had items ready for me in less than 48 hours and allowed me to collect as I was worried about Christmas post. As other have said the only reason packaging is a four is that there is no option for a gift box and , although box product was supplied in is top quality, it was just too small to add usable picture for jigsaw. Used a custom jigsaw to propose to my (now) fiancee. This product was great! She noted the quality of it as well. This product is 100% quality but the packaging of such a great product was terrible.It comes in a brown box which is taped together very very securely. If you are purchasing this as a gift you will need to buy a box for it. I was delighted at the quality of the jigsaw and the delivery was so fast. The only thing that I would suggest is that with jigsaws there should be the option of including a box with the photo on top for a little extra-I didn't think about how it would be packaged and because it was a gift I needed to go and get a gift box that was the right size. Even so I was very happy with my purchase, I have already recommended it to others! Delighted with this jigsaw. As described and was delivered in super quick time. Ordered Monday night, with me on Wednesday!